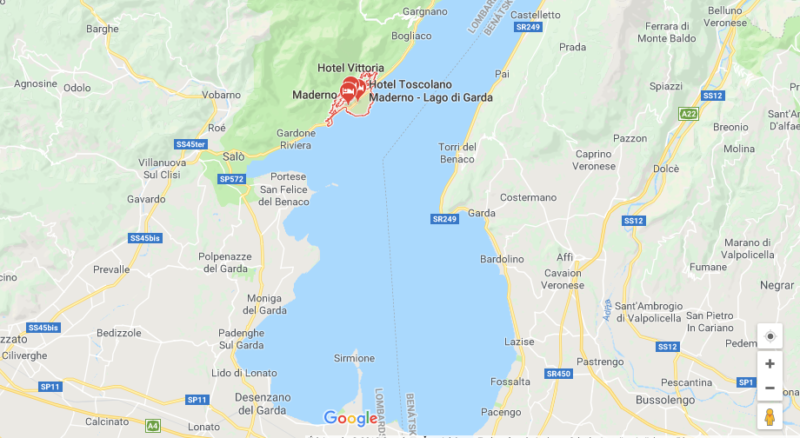 Where to stay in Lake Garda? WE say Toscolano Maderno! ‘Tosco what’… might be your very first reaction. Alright, you might have heard about Sirmione, Riva, about Limone or Salo but this cosy village on the west side of Lake Garda could’ve been out of your attention. Don’t worry, you probably won’t find it in many ‘Lake Garda tutorials’ or long ‘best places in Lake Garda’ lists. The reason is basically very prosaic, Toscolano-Maderno is not very huge and unfortunately or rather thanks God not even extremely popular or touristic. And this purity and touristic virginity is what WE love about it! Toscolano-Maderno is definitely one of those places where to stay in Lake Garda to avoid massive attacks of touristic crowds. Let’s get rid of some possible unrealistic expectations right from the beginning. If you think that there is not a single tourist in Toscolano-Maderno you’re wrong. I mean, it’s pretty hard to find a place in Lake Garda which would yawn from emptiness during the main season starting in May and finishing in October. The biggest advantage of Toscolano is that it’s more a place to be for local Italians than other tourists. There can be packed weekends in this place but it’s always less crowded than (for me) absolutely overrated Sirmione. Before you pack your swimming shorts and a sunbathing cream, discover this snug town with We Solo Travel. The best place where to stay in Lake Garda is located on the west Brescian shore of the lake, between more popular Saló and Gargnano. It’s not a big secret that Toscolano-Maderno is actually a common name used for two separate villages \ towns. The first one is Toscolano which – they say – it’s an industrial centre (I haven’t seen anything industrial over there) and Maderno – a tourist resort. These two towns have less than 55 squares kilometres and are homes of less than 8000 people. The town is surrounded by 1,500 metres tall mountains called Monte Pizzocolo. Why Should You Visit This Teeny Garda Place? I bet it won’t take a long time to persuade you to choose this almost unknown beautiful destination. 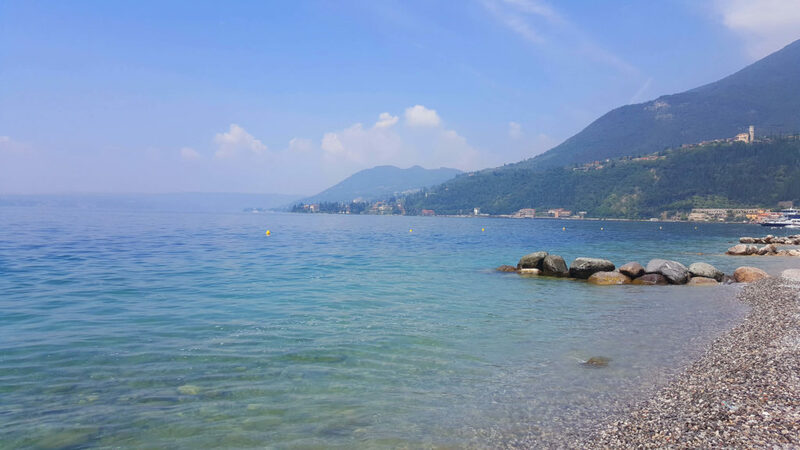 The main reason is wonderful location on the less rocky side of the lake which also offers a wonderful daily view to the rest of the Lago di Garda. The beach of Toscolano is long enough to find a little piece just for yourself. The beach starts directly after a small marina with two ferry stations and finishing somewhere before Via Cecina where the terrain gets rockier. The good news is: it really offers several great spots to chill your hot head! I’d say that 90% of the beaches are shingle but the only paid one called Lido Azzuro is sandy. The umbrellas and beach beds over there are comfy. The best thing to do is just walk or bike around the Toscolano shore and move from one little beach to another. The colour of the water changes different shades of blue. 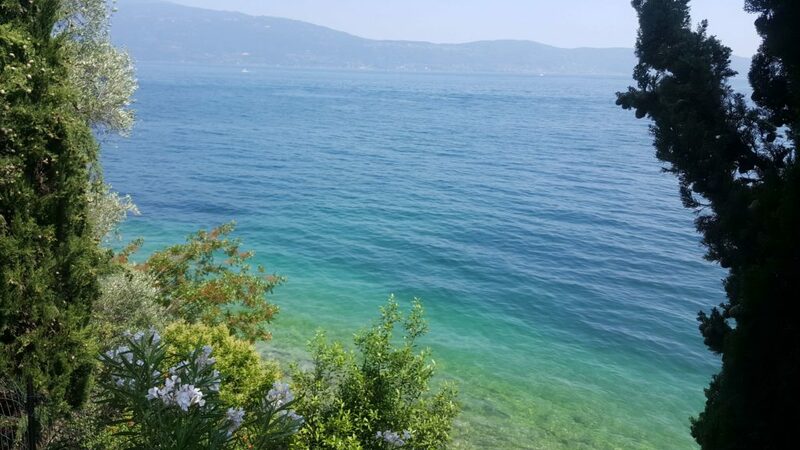 If you’ve just asked yourself ‘can I swim in lake Garda’, the answer is pretty easy. Yes, you can swim in lake Garda, actually you should swim there all day long! The Water in Toscolano-Maderno is generally very clean and even quite warm. I’d just avoid the port area for campers (it’s on the east side of Maderno). You know, people are usually stupid and their ignorance go so far that they trash the stuff around… Apart of this, you should be totally amazed by the quality, temperature and definitely the appearance of the water. What about a Beach Hunting Bike Tour? There is also an easy option how to get to even prettier and more tranquil beaches. Take a short but exercising bike tour towards Bogliaco and Gargano and discover tiny shores on the go. It’s much safer to take the smaller road up the Via Cecina, the main one is too busy and narrow. However, if you don’t want to miss the hidden beaches you’ll have to choose the main one to not spot any of them. We found our almost private bay somewhere in between the Marina of Bogliaco and Gargano. We shared it just with a few locals. The view to the eastern side of Lake Garda was also pretty stunning. We’ve answered the question about Lake Garda being expensive already in this article. Toscolano-Maderno gives you fair prices and nice food which is pretty awesome combination, isn’t it? The service in all of the restaurants WE visited was friendly, polite, quick, helpful and professional. The most common dish in this area is pizza but there are a few places which decided to choose different ways of impressing Toscolano visitors. One of the restaurants which doesn’t serve any pizza is Il Cortiletto. 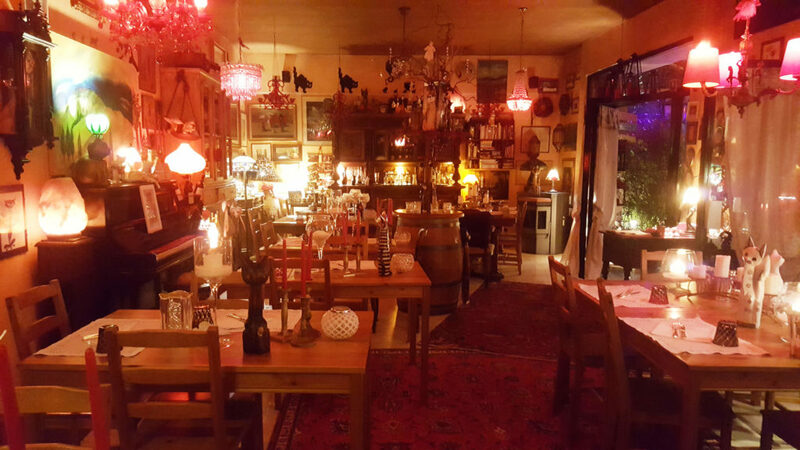 The place specialise in preparation of special home made pasta and meat dishes. WE took Fresh pasta with lemon pesto and perch and Scampi ravioli with fresh vegetables and tomato sauce, served as starters . The portions were small and a bit more expensive but the taste was just delicious and intense. Il Cortiletto offers also a wide variety of meat and fish dishes so it’s a perfect place for those who sooner or later will give up on eating pizza. Eating at Osteria Gatto d’Oro is one of those cuisine experiences which can’t ever be erased from one’s memory. There are many things one will remember. On the first place it’s definitely the bill, then it’s the eccentric owner delighted from her own success, and then it’s the creepy look of the place itself. Wait and where is the food? Alright, it would be more than fair to say that the food is really tasty. Slightly overpriced but made with love, proud and passion. If you love truffle go to Gatto d’Oro. The truffle they serve is local and very rare. It will be most likely the best truffle you’ve ever tasted! Apart of these three things everything else is… just creepy. The proud owner probably decided to shock everyone by everything. Your wine is served in massive wine glasses which are bigger than your head. Do you like oils and vinegars? Great! The owner or her only assistant will serve you with wide selection of these. Expect a big box landing on your table which is already super packed with monster glasses and monster plates and another dozens of very unnecessary and creepy decorations. You can taste cherry balsamic vinegar, orange one, lemon one, apple one and so on, you can get crazy from all these vinegars. This place is very special and worth the experience but it’s not for everyone. The overpacked interior and exterior, the stuffed cats and the pictures of cats and the wooden cats and the huge candles and another 1 million of absolutely unique but weird items can cause you dizziness. (It took me one hour to get used to it). Also, the owner can get less polite when you order less stuff so rather order at least four dishes. Did we make you to travel to Toscolano? Yeah? So it’s time to reveal some details about the best possible accommodation you might get. As we all know, the place where you sleep, take a shower or eat your morning croissant is very, if not the most important. And WE got lucky or WE got the right choice. Amongst dozens of hotels and flats promising us beautiful views and easy access to the beach we chose Villa Guilia, a group of 3 Bed & Breakfast apartments. It was just perfect! Even when the family lives directly on the first floor while the apartments are situated on the second floor, we were enjoying 100% of privacy with daily access to the pool, yummy breakfast, modern & recycled design, and totally stunning terrace which was just huge. The location couldn’t be better, a couple of minutes from the beach, the center and 5 minutes from the local supermarket. 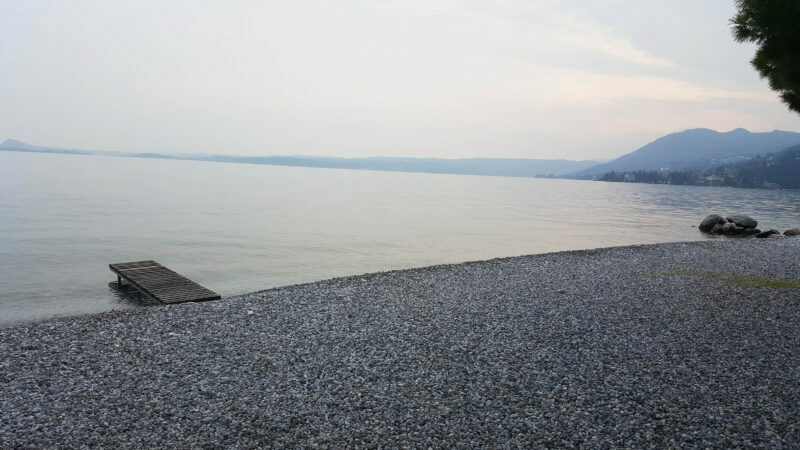 So Where to Stay in Lake Garda? Toscalano! Let’s summarise this! You have a long coast full of beaches, amazing views anywhere you look, daily ferry connections, bike roads, dozens of restaurants withe lovely & cheap food and the Villa Guilia! Probably one of the main points which made our Toscolano-Maderno experience unforgettable. I can bet there are plenty of other small villages worth staying in. So when choosing where to stay in Lake Garda try to avoid the notoriously famous ones. You can always visit Sirmione and Riva by a picturesque boat trip. Anyway, if you choose any location of Lago di Garda you won’t regret. The colours of Lake Garda haven’t faded yet. They’re still there and hopefully will be…forever.